MHA IB ACIO Syllabus 2019 Pdf (आईबी एसीआईओ पाठ्यक्रम पीडीएफ – एमएचए आईबी टीयर 1 और 2 परीक्षा पैटर्न डाउनलोड करें): The Assistant Central Intelligence Officer (ACIO) recruitment in the IB has been released on the official website of MHA. The vacancy is for the Grade II officer where 318 seats are available. The IB has now released the ACIO Exam Pattern and Syllabus for guiding the candidates about the exam papers. The examination process will be in two phases TIER I & TIER II. The examination process will be written to be held at various centers across India. Therefore, the candidates are advised to follow the IB ACIO Syllabus 2019. For all the participants of the IB ACIO Recruitment examination, IB ACIO Syllabus pdf is provided to start their preparations. As the overall selection process will constitute 250 marks, good preparation is very crucial for all the candidates. To ensure that whole syllabus is covered candidates can download the IB ACIO Exam Pattern and Syllabus from the official website. Here in this article candidates can find the essential details in the easy and summarized form. Candidates can check the details mentioned below about the IB ACIO Latest Syllabus for getting full information. The ACIO recruitment examination will be conducted in 3 phases. The TIER I will be of more than the TIER II. Hence, it is necessary for participants to crack the first phase for proceeding further in the competition. The IB ACIO Paper Pattern will help the candidates to get an idea about the type of questions and their marks. Further, the MHA ACIO Syllabus will help you clear your doubts in preparing for the exam. The candidate made available the detailed syllabus for preparation of all the subjects well. The questions asked in the exam will only be from the topics mentioned in the IB ACIO Exam Syllabus. Hence, is the candidates want to score high in the Government Jobs they are advised to prepare all the topics mentioned in the syllabus well. General Awareness Inventions and Discoveries, Sports, Indian History and Parliament, Famous Days Dates, Books, Authors, Indian Politics, Indian Economy, General Science, Current Affairs, Tourism, Artists, Culture and other basic daily news. Mathematics Areas, Percentages, Compound Interest, Time and Distance, Odd Man Out, Time and Work Partnership, Ratio and Proportion, Probability, Averages, L.C.M and H.C.F, Numbers and Ages, Simplification and Approximation, Mensuration. 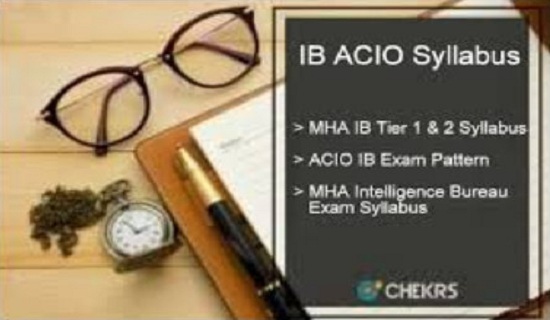 Ministry of home affairs has released MHO IB ACIO Exam Syllabus 2019. With the help of Intelligence Bureau JIO Syllabus provided here, applicants can score well in the exam and get qualified. To receive more updates on IB ACIO Exam Pattern and syllabus, keep visiting our site www.jobs.chekrs.com. We provide you the latest alerts on Intelligence Bureau job posts. In case of any query or review, you can place your valuable comments in the commenting section below. We will revert you in a short while.